In 2015 the Royal Australian Mint produced a number of collector 20 cent coins that were available to buy when you purchased a newspaper. Collector interest has always been with the limited release red coloured poppy dollar coin issued with the set. But for those with packyboxitis* and an interest in errors here are a couple of mistakes that you need to look out for. Recently a collector contacted us about an anomaly in the packaging of one of the 20c coins in the set. 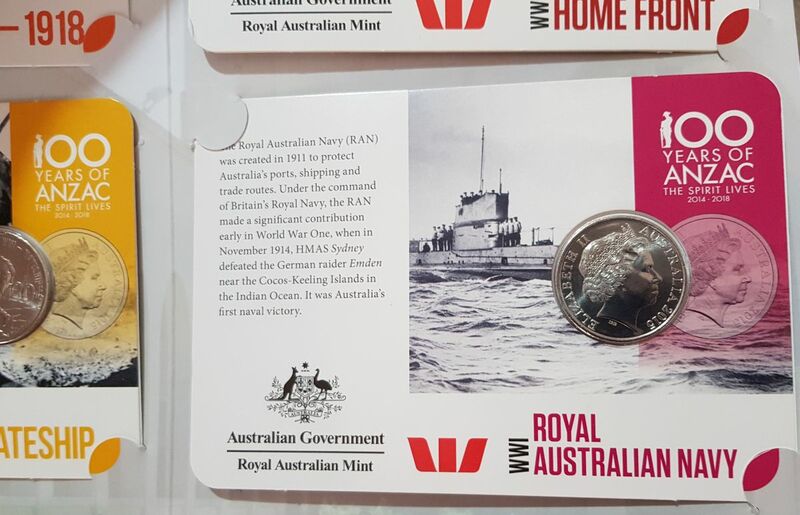 Their Royal Australian Navy 20 cent has been sealed into the packaging the wrong way around. It has the Queen’s head or obverse side facing out (see above) and as a result you cannot actually see which coin the packaging holds. Another error is the wrong coin type in the labelled packaging. 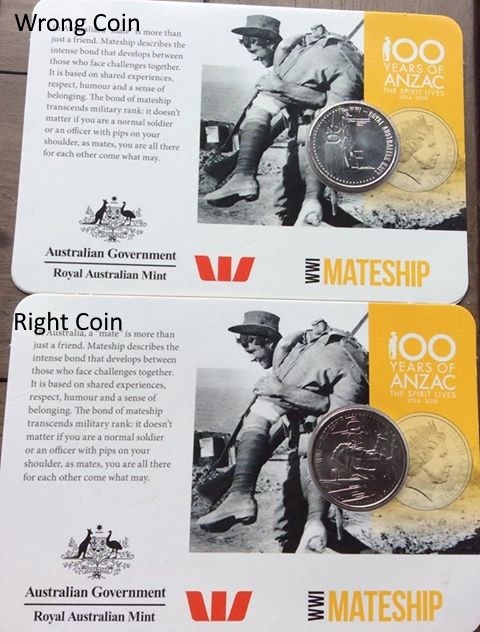 The coin pictured below (top) is a Royal Australian Navy coin in the wrong Mateship packaging. The coin below (bottom) is how this packaging should actually appear. We call this a packaging error as there is nothing specifically wrong with the coin. Of course one must take due care and inspect the packaging closely to see if there is any evidence of tampering if identifying this kind of error. There have been a number of packaging errors made at the Mint over the years, a few which appear in the coin catalogues. Probably the most notable is the 1986 mint set with the 1985 dated 10c piece. Thanks to the coin owners and Blog readers for permission to share. *packyboxitis is a made up name used in the collecting world for collectors that obtain items because of the way they are packaged. For example the same coin in its packaging might be in a collection twice because it was issued in different packaging.